Finally getting an update up… reorganized the studio, making collages and other stuff. Have a bunch of Suggested Drawings to get done/photos and online. Soonish. For now- here is the poster I created for Flatofest. This is a concert that I arranged to lure my friend Jason to Lincoln (from SF) for a visit. He said “if you can get these 4 bands to play I will fly out there…” and so I did. With the help of Dub at Duffy’s, we have a venue and some bands to play at it. About the poster – one of Jason’s hobbies is documenting the ever-changing landscape of graffiti-ed trucks in San Francisco. This is a hobby bordering on compulsion, and fa good thing too, because there are litterally hundreds of tagged up trucks moving around the city at any given time. This poster is based on a photo he took while I was visiting back in January. 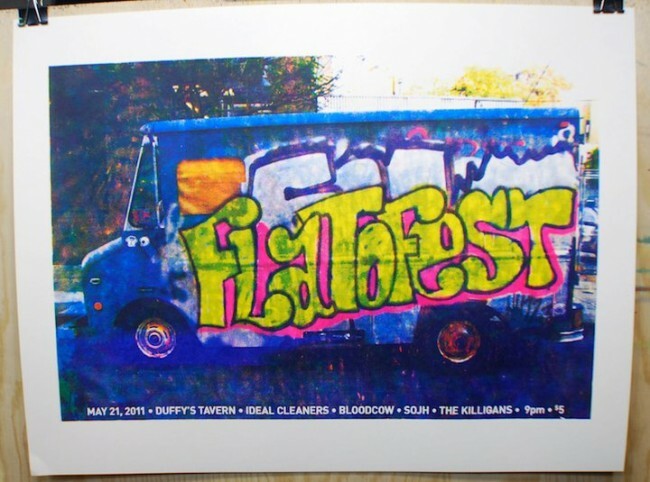 I basically graffiti-ed the truck using photoshop, then printed it in my patented fake-process color scheme. For added eye-popping color I used a bright golden yellow, hot pink, and neon blue.